Mayor and Councillors, Hearings Committee, Chair of Infrastructure Services Committee, Chief Executive, General Manager Infrastructure and Networks, General Manager Services and Development, Group Manager Water and Waste, City Planning, City Development Team, Resource Consents Team et al. 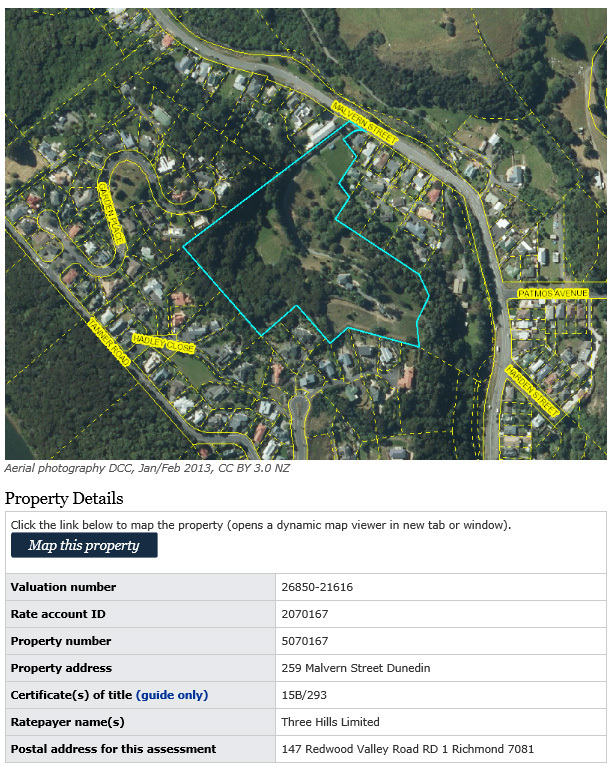 This consent was an application to/for earthworks to form building platforms for 19-lot residential subdivision at 259 Malvern Street Dunedin. This was considered by the Council’s Senior Planner (Consents) on 1 January 2008. 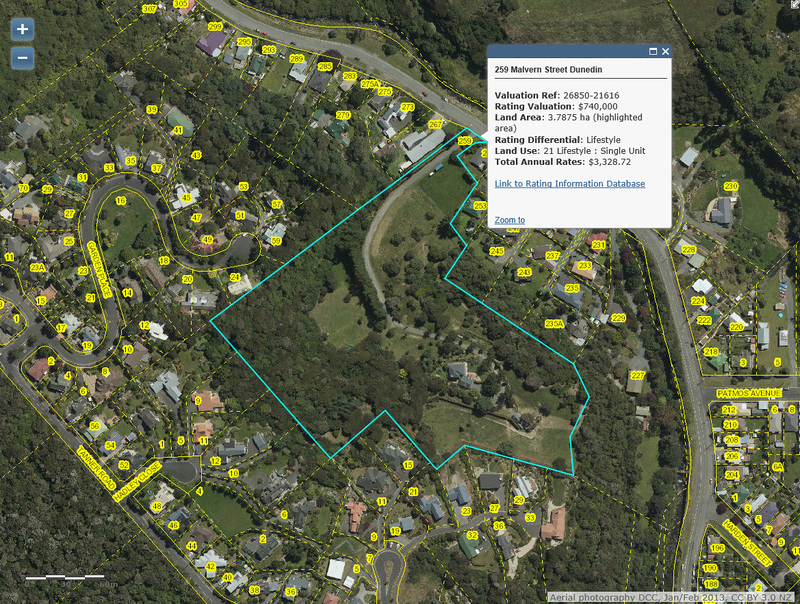 Wed, 26 Aug 2015 at 10:10 a.m.
There’s a 19-lot subdivision underway in Malvern Street, just past the bridge after Patmos Avenue. What makes this odd is that it was granted non-notified consent. There is a ground swell of anger that this has been allowed. None of the residents knew anything about it until it was through. It also appears to be within Dunedin’s Leith Valley Urban Landscape Conservation Area [ULCA24], that incidentally was foisted on me. I spent $25,000 fighting this including appealing to the Environment Court. I employed a QC, a barrister and an Environmental Planner. In summary, the Judge said I had a right to feel aggrieved. However, he was reluctant to make a ruling that could potentially open the floodgates to other cases against a local authority [DCC]. It meant people like me, and all the other affected re-zoned owners were privately funding a public visual amenity, a de facto reserve. 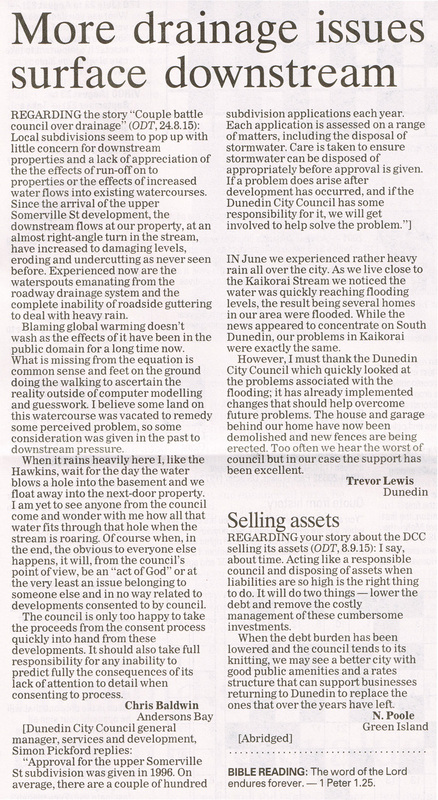 The reason I felt so aggrieved is that it has happened to me before with an eight and a half acre section directly opposite Millbrook in Queenstown. My partners and I have owned this for about 26 years and have been obstructed for that entire time. Surrounding us everywhere is quite intensive development and ours remains an island of undeveloped land. Our intentions had been for very restrained use, unlike our more successful neighbours, who are clearly “better connected” than us! The Leith Valley case is odd. The ULCA was supposed to protect the rocky escarpment and bush area and the latest development doesn’t do that. I’m not certain, but I’ve been told the developer is John Dunckley, a valuer. He used to live on-site but now lives in Motueka. Ironically, he objected to a neighbour’s subdivision on the grounds of spoiling his view. One has to wonder how on earth this was granted by the DCC. A reward for favours past? John Dunckley is the ‘stadium valuer’. He put the eye-watering $225M value on the just completed well over budget stadium. That in effect validated the cost overruns. It appears the developer Dunckley has chosen to push through with subdivision prior to public consultation of the proposed 2GP this year. Very possibly, the existing overlay of ULCA24 should have been one of the factors necessitating full public notification of the application for (land use) consent. The decision should be investigated or challenged due to the number of potentially affected / interested parties not made formally aware of the land owner’s or indeed the city council’s (covert) process and intentions. 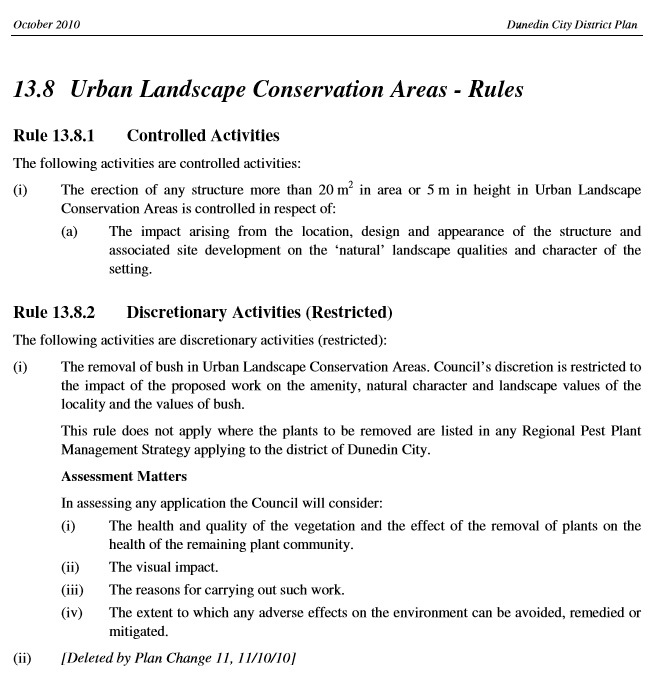 Urban Landscape Conservation Areas – means those areas addressed in the Townscape Section and identified on the District Plan Maps which provide a landscape setting for the urban areas. 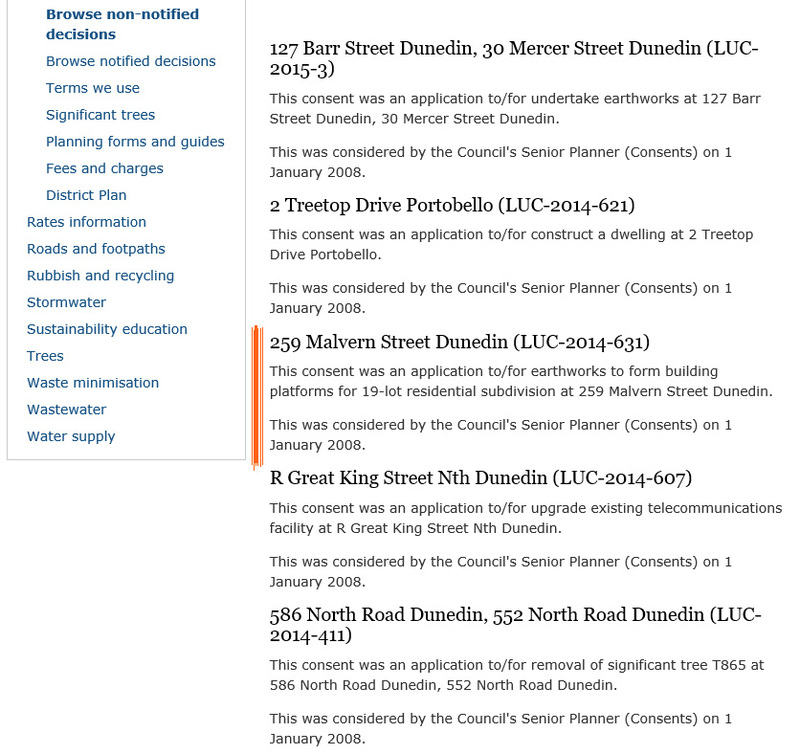 █ The 2GP appears to reduce Dunedin City’s biodiversity in residential areas due to Dunedin City Council’s unconstrained support for private speculator/developers to subdivide property holdings and intensify/densify construction, resulting in the removal of existing ULCAs from significant and potentially regenerative conservational environments. A review of Urban Landscape Conservation Areas (ULCA) has determined that it has been applied in most cases to public reserves. A large number of these reserves are sports grounds with limited vegetation cover and do not meet the intent of a ULCA. Instead the ULCA Zone has functioned as a default reserves zone. 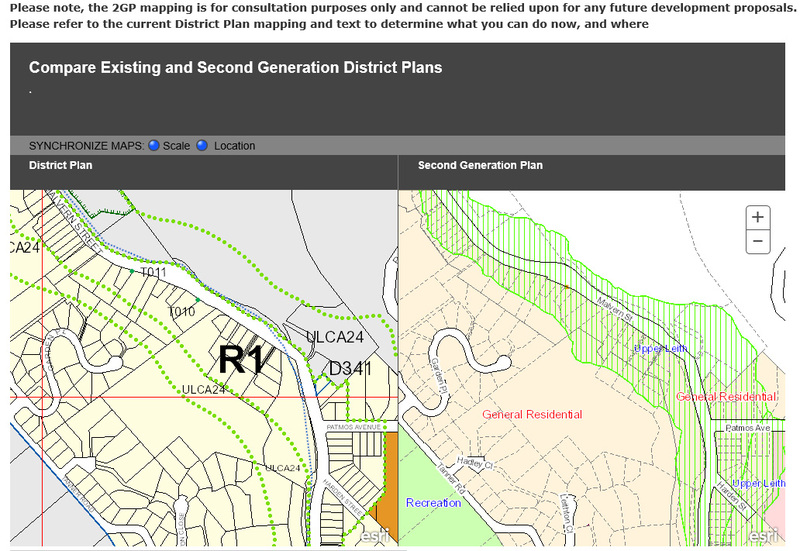 The preferred approach in the new Plan [2GP] is to zone large reserves as part of a new Recreation Zone which will better recognise the values of reserves (refer to Q&A: Community and Recreation Activities). This will reduce the need to include such areas as a ULCA. The approach to be taken with reserves in the 2GP provides an opportunity to reconsider the remaining ULCA areas and whether there are alternative approaches. Some large reserves, such as the Dunedin Town Belt contain extensive areas of vegetative cover that play a significant role in providing corridors for biodiversity and these values need to be recognised with a method that manages biodiversity. The ULCA also includes areas of private land, generally the vegetated steep sides of valleys or gullies, such as the Leith Valley, that provide biodiversity corridors. It is proposed to recognise their values in any method that manages biodiversity. BACKWARD STEP: Our environment is at risk if the Resource Management act is watered down. OPINION | The Resource Management Act (RMA) has sadly become a much maligned and misunderstood piece of legislation: a kind of universal public punching bag – if mentioned in conversation, it is almost obligatory to put the slipper in. To most Kiwis it represents bureaucracy and inefficiency – pen-pushing do-gooders and paper shufflers who engage us in excessively long and costly processes that get in the way of us Kiwis doing stuff. In fact the RMA – passed in 1991 – was a means of rectifying mistakes and providing at least some environmental and social integrity to development and planning process. It was recognised by legal minds to be a world-leading piece of legislation. It protected our environment and our economy based on the premise of sustainable resource management. What’s more, it was politically robust in that it received the blessing of both major parties. It also gave New Zealanders a chance to be heard and it facilitated local decisions made by local people. While the country’s environmental indicators such as water quality and biodiversity loss have still gone backwards – the RMA has stemmed what would otherwise have been fatal haemorrhaging. Similarly, the RMA has protected a set of fundamental Kiwi values: the notion of fairness and equity in regard to everyone having a right to their say; industry and other activities being required to take responsibility for avoiding, remedying or mitigating adverse environmental impacts; and developments being required to have regard to effects on such things as recreation, scenic values, private property rights, and the public’s access to rivers, lakes and beaches. The Government plans to alter the Act to give greater weight to economic development over environmental considerations, granting to itself the right to veto any issue. You don’t have to be legal-minded to see the impact of subtle word changes. While the consideration for the “benefits” of a project remains, gone are any references to the “costs”, making a cost-benefit analysis redundant because environmental “cost” is out of the equation. Gone, too, are the words: “maintenance and enhancement of amenity values”. That’s basically any recreational activity – walking, running, swimming, fishing, kayaking. Who likes doing that stuff anyway? Thankfully the “importance and value of historic heritage” stays. But its cobber, “protection from inappropriate subdivision and development” gets the boot – making the first clause meaningless. And my personal favourite, “maintenance and enhancement of the quality of the environment” has been politely asked to leave. Clearly such an unruly clause has no place in a legal act that’s trying to protect the environment. The changes also grant considerable new powers to central government, giving it the ability to take individual consent decisions away from local councils and place them in a new national body. The changes go further still, by allowing government the right to insert provisions in local council plans without any consultation. ● Former All Black Anton Oliver is an ambassador for Water Conservation Order NZ. Technical advisory group’s report recommends significant changes to section 6 of the RMA…the proposal to drop the requirement for decision makers to provide for the preservation and protection of indigenous vegetation and habitats as matters of national importance ignores Environment Court case law built up over the last 20 years. A Government-appointed advisory group has recommended a significant rewrite of the Resource Management Act removing references to the protection of coastal areas, wetlands, lakes and rivers and indigenous flora and fauna. Environment Minister Amy Adams released the report from a technical advisory group established after the Canterbury earthquakes with the primary task of looking at natural hazard issues relevant to the RMA arising from the quakes. “After the Canterbury earthquakes, it became clear that consents for subdivisions had been granted without any consideration of the risk of liquefaction,” Ms Adams said in a statement. However, the group’s report addresses much wider issues and recommends significant changes to section 6 of the RMA. As it stands [section 6] instructs local authorities to recognise and provide for the protection or preservation of the natural character of the coastal environment, wetlands, lakes and rivers when considering RMA applications. They must also provide for the protection of outstanding natural features and landscapes and areas of significant indigenous vegetation or wildlife. Protection must also be provided for historic heritage and protected customary rights while public access to and along the coastal marine area, lakes and rivers must be maintained. However the group’s recommendation proposes removing the words “protection” and “preservation” from the section entirely. The Dunedin Amenities Society will be holding an open day at the Craigieburn Reserve on Saturday 10 December, starting at 10:00 am. The open day will be the official opening of the reserve by the Mayor of Dunedin Dave Cull and the launch of the heritage interpretation trail developed on site for the Dunedin public. Gain your first glimpse of the Society’s year-long restoration that has developed an area of regional significance for Dunedin. There will be time to explore the reserve and gain insight into part of Dunedin’s unique settler heritage. 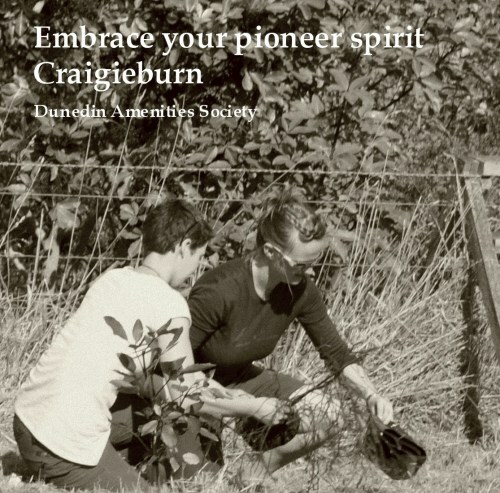 Come and enjoy this important event with the Society and embrace your pioneer spirit at Craigieburn. Billy tea and damper provided. On the 11th of September 1888 Dunedin lawyer Alexander Bathgate read an address to the Otago Institute entitled “The development and conservation of the amenities of Dunedin and its neighbourhood”. The address was the catalyst for the foundation of the Dunedin and Suburban Reserves Conservation Society, the forerunner of the Dunedin Amenities Society. 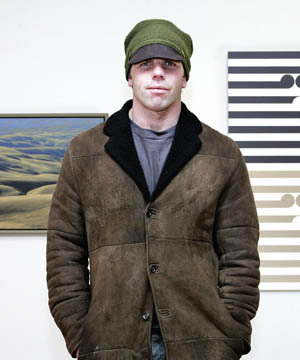 Bathgate outlined a vision for Dunedin that was so detailed in its construction that he apologised to his audience for “frightening you by the extent and magnitude of my programme”. What Bathgate outlined was both the protection of the existing natural landscape and the enhancement of the urban built environment in the developing city. It was a vision that blended the conservation of native biodiversity and landscape with the call home syndrome of “practical and prosaic colonists”. Check out the Dunedin Amenities Society website . . . have your camera ready!